There is no doubt that advances in medicine and surgery have saved millions of lives and relieved a tremendous amount of suffering. But, as Dr. Russell Blaylock explains in his Blaylock Wellness Report, we can do much better if we combine nutritional treatments with conventional medicine and surgery. In many instances, nutrition can cure diseases that do not respond to conventional medical treatment. 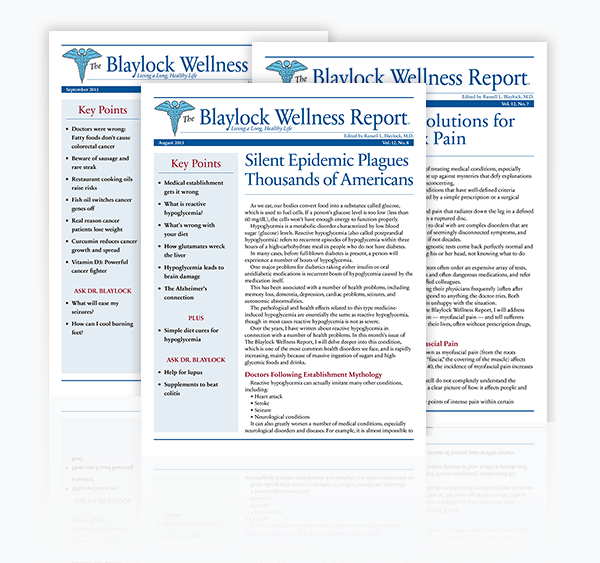 The Blaylock Wellness Report brings together a wealth of information from a variety of authoritative sources. The editor, Dr. Russell Blaylock, explains how you and your family can stay healthy and avoid some of the worst — and least-publicized — risks and pitfalls of modern living. Dr. Blaylock argues that the belief we may be "wired" for certain conditions as we age is not exactly true. Good nutrition and healthy living can do a lot to waylay, and sometimes even prevent, the activation of genetic switches that are linked to the most dreaded diseases of aging. Dr. Blaylock focuses on harmful and seemingly unavoidable environmental toxins we encounter on a regular basis (increasingly unhealthy food, pesticides and other industrial chemicals, and heavy metals) and the biochemical reactions that trigger the advent of a disease. Dr. Blaylock asserts that the profusion of strong drugs routinely prescribed for unsuspecting Americans frequently causes more harm than good — especially when benign natural treatments can accomplish much more in terms of actual healing, usually for less money. He offers a scathing indictment of the politics of the pharmaceutical industry's profit machine. In his first book, Excitotoxins: The Taste That Kills (Health Press, 1994), Dr. Blaylock made the connection between food additives (in particular, monosodium glutamate and aspartame) and degenerative diseases of the nervous system — alzheimer's, parkinson's and ALS. Citing new studies, Dr. Blaylock revisits the increasingly inescapable relationship between food chemistry and degenerative disorders. 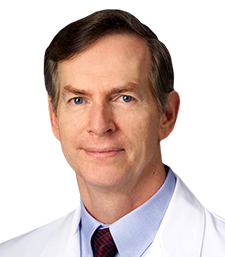 Dr. Blaylock also examines the diseases that most of us will eventually encounter as we age, including atherosclerosis, heart attack and stroke, osteoporosis and diabetes. Another theme of The Blaylock Wellness Report is "Protecting Your Brain" — specifically preventing and diagnosing degenerative nervous-system diseases. In each edition of The Blaylock Wellness Report, Dr. Blaylock discusses what systems of the body are affected by each disorder and the healthy operation of the physical systems involved, and explains what goes wrong when disease occurs. He also provides fascinating current theories about the causes of each disorder, and easy-to-implement practical alternatives to "big" medicine's treatments for many of these diseases. In addition, Dr. Blaylock challenges misplaced notions of physical "fitness" and highlights the small changes that can have a huge impact on healthy aging. For instance, citing numerous fitness and diet studies. Dr. Blaylock dispels the idea that aerobic exercise is the best way to achieve physical fitness; in fact, he demonstrates that aerobic exercise may actually be quite harmful for many segments of the population. He suggests alternatives, such as walking and isometric exercises, to achieve a healthy physical balance. Included with each discussion of a specific health danger is a comprehensive set of recommendations for avoidance, prevention and improvement, enabling readers to take an active, well-informed role in their own medical care and overall well-being. It has been estimated that more than 9 million people come into regular contact with known neurotoxins in the workplace, and tens of millions of us must live with these chemicals in our own homes. Most are not even aware that these commonly used chemicals can damage the nervous system. We assume that if they were really dangerous, the FDA or EPA or some other alphabet organization would have told us so. We put our trust in those who should not be trusted.